(i) Calculate the number of electrons which will together weigh one gram. (i) Calculate the total number of electrons present in one mole of methane. (ii) Find (a) the total number and (b) the total mass of neutrons in 7 mg of 14C. (iii) Find (a) the total number and (b) the total mass of protons in 34 mg of NH3 at STP. The number of protons, electrons, and neutrons in an atom is independent of temperature and pressure conditions. Hence, the obtained values will remain unchanged if the temperature and pressure is changed. Yellow light emitted from a sodium lamp has a wavelength (λ) of 580 nm. Calculate the frequency (ν) and wave number ( ) of the yellow light. (i) correspond to light of frequency 3× 1015 Hz. A photon of wavelength 4 × 10–7 m strikes on metal surface, the work function of the metal being 2.13 eV. Calculate (i) the energy of the photon (eV), (ii) the kinetic energy of the emission, and (iii) the velocity of the photoelectron (1 eV= 1.6020 × 10–19 J). Hence, the energy of the photon is 4.97 × 10–19 J. Hence, the velocity of the photoelectron is 5.84 × 105 ms–1. A 25 watt bulb emits monochromatic yellow light of wavelength of 0.57μm. Calculate the rate of emission of quanta per second. Electrons are emitted with zero velocity from a metal surface when it is exposed to radiation of wavelength 6800 Å. Calculate threshold frequency ( ) and work function (W0) of the metal. Thus, the threshold frequency of the metal is 4.41 × 1014 s–1. What is the wavelength of light emitted when the electron in a hydrogen atom undergoes transition from an energy level with n = 4 to an energy level with n = 2? How much energy is required to ionise a H atom if the electron occupies n = 5 orbit? Compare your answer with the ionization enthalpy of H atom (energy required to remove the electron from n =1 orbit). is 8.72 × 10–20 J. The number of spectral lines produced when an electron in the nth level drops down to the ground state is given by . (i) The energy associated with the first orbit in the hydrogen atom is –2.18 × 10–18 J atom–1. What is the energy associated with the fifth orbit? What is the energy in joules, required to shift the electron of the hydrogen atom from the first Bohr orbit to the fifth Bohr orbit and what is the wavelength of the light emitted when the electron returns to the ground state? The ground state electron energy is –2.18 × 10–11 ergs. The electron energy in hydrogen atom is given by En = (–2.18 × 10–18)/n2 J. Calculate the energy required to remove an electron completely from the n = 2 orbit. What is the longest wavelength of light in cm that can be used to cause this transition? Here, λ is the longest wavelength causing the transition. Hence, the wavelength of the electron moving with a velocity of 2.05 × 107 ms–1 is 3.548 × 10–11 m.
Hence, the wavelength of the electron is 8.9625 × 10–7 m.
(ii) What are the atomic numbers of elements whose outermost electrons are represented by (a) 3s1(b) 2p3 and (c) 3p5? As for any value ‘n’ of principal quantum number, the Azimuthal quantum number (l) can have a value from zero to (n – 1). (i) An atomic orbital has n = 3. What are the possible values of l and ml ? Using s, p, d notations, describe the orbital with the following quantum numbers. (a) The given set of quantum numbers is not possible because the value of the principal quantum number (n) cannot be zero. n1 = 1and n2 = 2. If the diameter of a carbon atom is 0.15 nm, calculate the number of carbon atoms which can be placed side by side in a straight line across length of scale of length 20 cm long. One carbon atom occupies 0.15 × 10–9 m.
The diameter of zinc atom is .Calculate (a) radius of zinc atom in pm and (b) number of atoms present in a length of 1.6 cm if the zinc atoms are arranged side by side lengthwise. ⇒ 1.6022 × 10–19C charge is carried by 1 electron. Symbols can be written, whereas symbols are not acceptable. Answer briefly. Let the number of electrons in the ion carrying a negative charge be x. Neon gas is generally used in the sign boards. 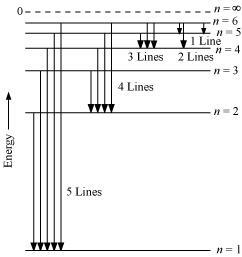 If it emits strongly at 616 nm, calculate (a) the frequency of emission, (b) distance traveled by this radiation in 30 s (c) energy of quantum and (d) number of quanta present if it produces 2 J of energy. Therefore, 32.27 × 10–20 J of energy is present in 1 quantum. In astronomical observations, signals observed from the distant stars are generally weak. If the photon detector receives a total of 3.15 × 10–18 J from the radiations of 600 nm, calculate the number of photons received by the detector. Hence, the energy of the source (E) is 8.282 × 10–10 J. Hence, the threshold frequency of radiation (ν0) is 4.593 × 1014 s–1. Hence, the velocity of the ejected photoelectron (v) is 4.52 × 105 ms–1. Note: part (b) of the question is not done due to the incorrect values of velocity given in the question. Hence, for the transition to be observed at 1285 nm, n = 5. Uncertainty in the momentum of the electron = 2.637 × 10–23 kgms–1. The bromine atom possesses 35 electrons. It contains 6 electrons in 2p orbital, 6 electrons in 3porbital and 5 electrons in 4p orbital. Which of these electron experiences the lowest effective nuclear charge? The higher the atomic number, the higher is the nuclear charge. Silicon has 14 protons while aluminium has 13 protons. Hence, silicon has a larger nuclear charge of (+14) than aluminium, which has a nuclear charge of (+13). Thus, the electrons in the 3p orbital of silicon will experience a more effective nuclear charge than aluminium. Indicate the number of unpaired electrons in: (a) P, (b) Si, (c) Cr, (d) Fe and (e) Kr. (a) How many sub-shells are associated with n = 4? (b) How many electrons will be present in the sub-shells having ms value of –1/2 for n = 4? For a given value of ‘n’, ‘l’ can have values from zero to (n – 1).